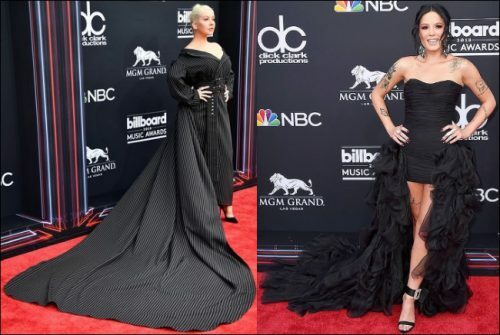 Black ruled the red carpet at the 2018 Billboard Music Awards last night, but there were no simple little black dresses in sight. Instead, the looks included diverse patterns, designs and materials. Which was your favorite ensemble? Kelly Clarkson wore a side-slit structured-shoulder Christian Siriano dress. Mila Kunis showed off her new bangs and wore a single cold shoulder top and skirt both by David Koma. Jenna Dewan looked edgy in a strapless Zuhair Murad leather mini dress. Natalie Morales rocked out in a fit and flare Jovani dress. Ashlee Simpson was all covered up in a long-sleeved Yanina Couture dress. Chantal Jeffries wore a skin tight ensemble. Christina Aguilera set a path in a striped Christian Siriano shirt dress. Halsey wore a strapless Redemption dress and Lorraine Schwartz jewelry. Bebe Rexha wore a side-slit Christian Siriano dress. Tyra Banks showed off her curves in a body-hugging ruffle-sleeved dress.